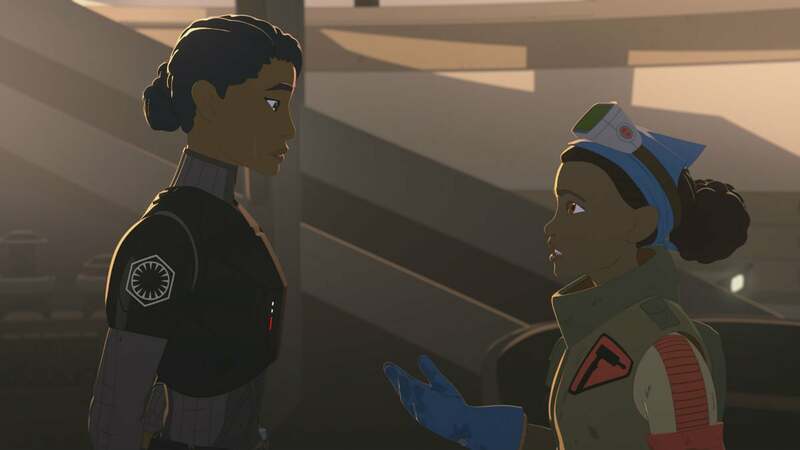 It took some time, but Star Wars Resistance finally gave us the hero we’d all been waiting for. And his name is Kazuda Xiono. After a whole season of Kaz being a rather polarising character, what with his goofy demeanour and penchant for idiocy (as well as ace flying and heroics), the new episode, “Descent,” finally showed him reaching his potential in a way that was as thrilling as anything we’ve seen on the show so far. Last week’s episode, “The Disappeared,” ended with the First Order finally finding Yeager, Kaz, and the crew because of the Fireball. They’d tracked the ship from Kaz’s recent mission with Poe and knew a Resistance spy was there. 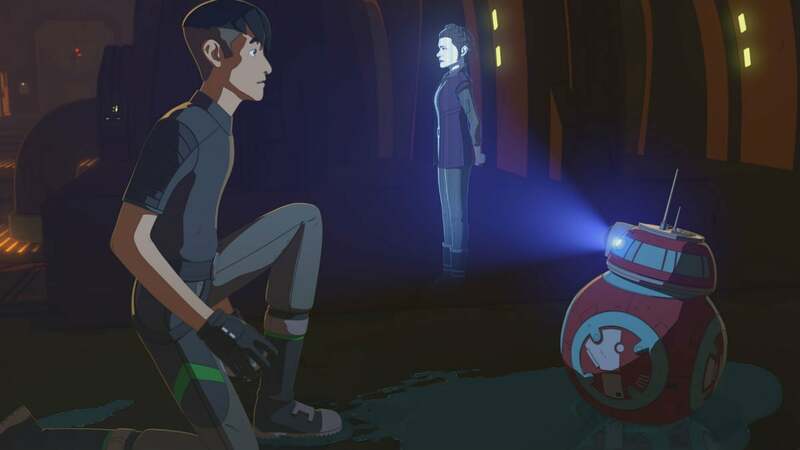 During a daring escape from the First Order, Yeager, Kaz, and Neeku got out while Tam was captured, mostly because she’s still sympathetic to the First Order and didn’t understand why this was all happening in the first place. Meanwhile, Yeager, Kaz, and Neeku end up hiding with the shell folk who live under the platform and Kaz hatches a plan. The plan is to literally sink the entire Colossus so they can reach the very top of it and disable the First Order’s communication blocker. It’s a huge, wild plan that probably happened a little too quickly and easily when you think about it. But that’s ok. Better it happen quickly to get what was coming next than to take three episodes of planning. By turning off the First Order’s device, Kaz was able to get a message out to General Organa and the Resistance: We need your help. Plus, not only did he get that message out but, he quickly received a response. A response that cost Yeager his freedom, as he sacrificed himself to allow Kaz to escape. Now both Tam and Yeager are prisoners of the First Order. After an episode that had Kaz escaping, hatching a dastardly plan, and then pulling some Jyn Erso maneuvers on the communication tower, it was the Kaz moment we’d all be waiting for. He’s finally become a Star Wars hero. But...what base was Leia talking about? We know from the movies she’s probably on D’Qar at the moment but that’s going to change literally any day now once the Resistance destroys Starkiller Base. So, will Kaz and his friends escape to this location only to find the Resistance never made it there? It seems like a good possibility.